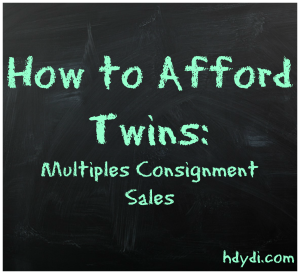 How to Afford Twins: Multiples Consignment Sales | How Do You Do It? While having more than one baby at a time doesn’t necessarily mean you need two of everything, there are things you will need double or triple. You can stretch your dollars buying used. 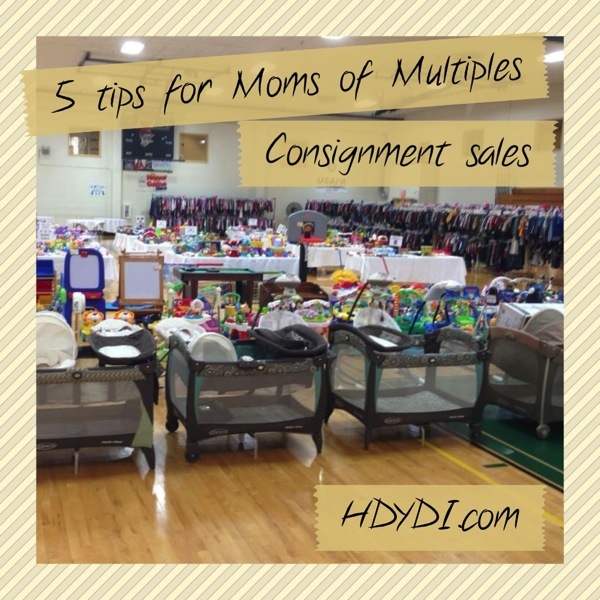 When I was pregnant I found my local Mothers of Multiples consignment sales to be invaluable. Families who have a bunch of kids at once tend to have a bunch of baby stuff, and some of it is only used a very short time. I live in the suburbs of Chicago and there are several nearby MoMs clubs who hold twice-yearly sales of gently used baby and kids stuff. These sales are generally held in a park district gym or a church basement. I was able to shop at 3-4 different club sales during my pregnancy and my boys’ infancy and get a ton of essentials and clothing for a fraction of their retail cost. And because I was also a member of a club, I was able to sell my stuff as my boys outgrew it and recoup a lot of what I paid. For some things like exersaucers and baby gates, it was almost like renting them. I paid $20 for an exersaucer (and let’s be honest, those things will last forever and have a short, but in our case priceless, lifespan.) and sold it back 6 months later for $20. I have since seen very familiar exersaucers show back up at the sale time and again. I would love to know how many families have gotten use from one exersaucer! By shopping several resale events I was able to curate an adorable, inexpensive and corresponding wardrobe for my twin boys. 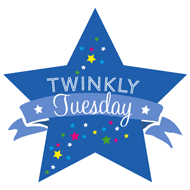 Often there would be two outfits that matched or were similar, sold by other families with twin boys. I was able to find a family with boys a couple years older and have bought most of their outgrown clothing for the past couple years. In cases where I only found one item I liked at a sale, like an adorable argyle sweater for Christmas pictures, I was often able find a similar one at another sale. As my boys have grown, I have been able to sell off most of their baby stuff, and unload tons of clothing, and pick up the next sizes from the proceeds. Now that my babies aren’t babies, it is harder to find clothing since a lot of clothing for this age group (boys especially) is worn out or ruined and doesn’t make it to the resale. Our need for lots of gear is gone. I do still find toys for a bargain, puzzle and games, and swimwear, coats, snow pants and boots. I think my best resale shopping is behind me, but I do no hesitate to recommend resale shopping to expectant families, whether pregnant with multiples or not. Join the club. Members of our local MoMs clubs are able to sell their items and shop before the sale opens to the public. Local clubs in our area even have reciprocal early shopping for neighboring club members. I have been able to shop the night before, early bird an hour before the doors open to the public and even had guest passes to offer a friend for my own club’s pre-sale shopping. Get there early If you’re not able to get in to pre-shop, get there early. If the doors open at 8 am, expect people to start lining up by 6:30 or earlier. For my club the same woman is always first in line, usually in line by 6 before any club members are even on site to get set up for the day. As a volunteer I have heard several people complain about the clothing selection when they show up an hour before the sale ends. While some sales have a half-off or fill-a-bag option at the end of the sale, if there’s something you know you want, get there early. Bring a laundry basket to carry your items. Most sales I have attended do not allow strollers or wagons on the sales floor, so be prepared to carry your kids or leave them at home with someone. Prioritize your shopping list Know what you’re looking for and head straight there when the doors open. Be flexible and realistic. If you’re hunting for a double stroller, there’s may only be a few options, so go there first. Don’t assume you will be able to get the exact brand or pattern for gear, or even matching items or outfits. I generally made a list of things I wanted to find, listed by priority. If you really need winter coats, don’t lose valuable time at the toys tables. The inventory of these sales can vary widely and you may not get everything on your list. Bring your best stuff and price it right If you’re selling your stuff, bring your best. If you’re missing parts or something doesn’t work, it shouldn’t be sold. Check for recalls to ensure the things you are selling are safe, and if your clothing is stained, ripped, or from 1982, it shouldn’t be in your resale inventory. If your goal is to make the absolute most money for your items, consider selling them individually on eBay or though local classified or garage sale groups online. When most of the clothing is $1-3 per piece, your $8 used pajamas probably aren’t going to sell. Remember, it’s just stuff It is great to get a bargain, and everyone wants to save money, but it’s just stuff. Have clear expectations of what you can get. Sure you may find things new with tags, or a real steal on a bouncy seat, or the perfect double stroller you’ve been dying for, but it’s also clothing your kids are going to spill on, spit up on or rip the knees out of, it’s a piece of equipment that your baby will use for a few months. I’ve seen people grab all the clothing for a particular size and then go through it later, grab things and “hide” them in other areas so they can stake their claim, and get upset with the volunteers who are working because they can’t find suitable matching outfits, don’t like the selection of used toys or wanted a single not a double stroller. It’s just stuff. The workers are all volunteers, other Moms of Multiples, helping their club and clearing out their own closets. Be nice. Jen is a stay-at-home Mom of twin boys who will turn 4 in November who has been bargain shopping and dressing them in second-hand clothing since birth. Thanks for the tips! I am excited to go to my first consignment sale tomorrow! It’s a presale, so hopefully it won’t be too crazy. It’s not a multiples one though. Pingback: From the Archives: Secondhand Shopping and Shopping Cheaply - How Do You Do It?